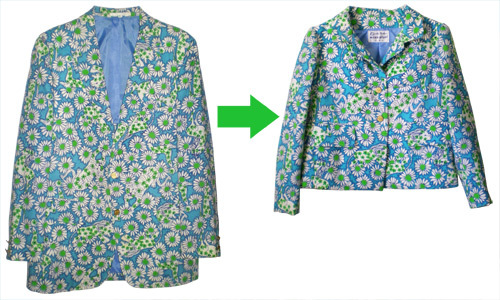 I recently took this awesome, bold printed Lilly Pulitzer Mens Stuff jacket and cut it down so that it would fit me. 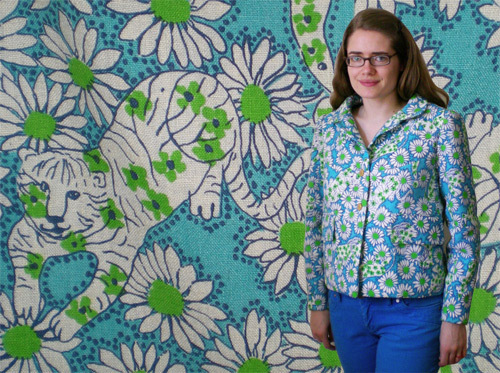 I used the same pattern set that I used for the color swatch dress, this time following the jacket pattern. The choice of pattern was determined by whether it used the same or less fabric than the original. The original jacket is classic men's single breasted style with a two-part sleeve. The new jacket style is a loose, boxy shape with a low yoke that shapes the bust. I made a point to keep as many of the original's details including the flap pockets and the awesome gold lion buttons. The original jacket was only partially lined, so I did have to purchase new fabric for the lining. Amazingly, even though the new jacket is a lot smaller, I used almost all of the original fabric. Last year, Alec's grandfather, E. Howard Goodwin passed away. He was a very sharp and classy dresser during his life. Alec inherited his grandfather's amazing tie collection along with a couple bright suits from Lilly Pulitzer's Mens Stuff collection dating from the late 1960's to early 1970's. Since Alec is not one to wear bright, bold prints he gave the pieces to me to do whatever I wanted. I only met Howard through video chat before he passed, but now I have something to continually remind me of him. Inside the jacket was this neat, old tag from the Amalgamated Clothing Workers of America union. A nice touch from times past.